RoadTrucker 12-Volt Cooking is designed for When Your Truck or Vehicle is Your Kitchen. RoadPro and Koolatron brings you 12-Volt Cookers, 12-volt portable stove, 12-Volt Pizza maker, 12-Volt grill, 12-volt frying pan, and 12-volt portable sandwich maker. And we have a new one for you to try. It's called a Skottle. Next rest stop, toss some burgers or veggies on the Skottle and in minutes, you have a hot meal. 12-Volt Cooking Items can help you stay healthy on the road, while saving you time and money. Bring your homemade meals and veggies and cook right inside your truck, RV or car. Not only will you get to enjoy hot meals, but you will also eat healthier and save money by not buying from truck stops and fast food restaurants. 12 Volt RoadPro and Koolatron cooking items can be plugged directly to your cigarette lighter socket so you can use them anytime, anywhere. Great for stews and full meals! The RoadPro 12-Volt Portable Stove is a great cooking item to serve your favorite meals. A trucker favorite for re-heating leftovers, warm-up soup or noodles or cook frozen tater tots. The RoadPro Lunchbox Stove uses 8" x 3-3/4" x 2-1/2" disposable pans (aluminum) for easy clean-up. Always on the go? Bring this mighty stove with you and you don't need to make a stop-over for a delicious & healthy meal. The Koolatron 12-Volt Portable Grill creates delicious meals every time with less fat then other on the road cooking. Going out with the family? Grab a nice and thick slice of ham steak or hotdogs from the fridge and threw them on the grill for a meal-time treat. The Koolatron 12-volt grill also saves you money by not stopping on truck stops for a hamburger -- because you can make one yourself! Prepare your favorite ham, bacon, eggs, or hamburgers, plug the frying pan into your cigarette lighter socket, and enjoy yourself right inside your vehicle. If your going out with friends for a weekend getaway or camping, this one is for you! Ideal for Mobile & Active Lifestyle! 12-Volt Oven and Pizza Maker from RoadPro is a great use for pizza-lovers. The RoadPro 12-volt portable oven is really easy to use, just plug it into 12-volt socket and use the folding carry handle for storing. The RoadPro Sandwich Maker is a handy and compact 12-volt item. Grab some cold sandwich ingredients and meat slices out of the cooler, and create your own sandwich combination. Stay active and full on your way to the office, or anywhere you're headed to. Simple to use Portable Saucepan for your mobile, on-the-go lifestyle! Just plug it into your 12-volt cigarette lighter or 12 Volt Port, and enjoy a snack or meal in the comfort of your vehicle. Prepare canned or packaged soups, stews, and steam hot dogs. Lightweight and compact, it can be stored almost anywhere. Tired of the limitations of the 12 Volt Plug? Here is a new idea, that is actually quit old. It’s called the Skottle Grill and cooks fast, just like an outdoor Grill or an old cast Iron skillet. Cook your favorite dish. How does a hot breakfast omelet and hash browns sound in the morning. Or a pizza for lunch and a juicy steak for supper? Uses a Colman High-Performance Burner. No Messy Charcoal. Cools Fast, in about 10 minutes. Removable legs for convenient carry and storage just about anywhere. 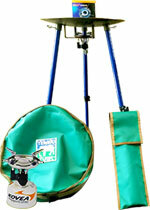 Note: The Blueridge Skottle Carry Bag may be Substituted for the Step22 Skottle Carry Bag When Out of Stock. Sorry No Color Choice.